SPIROL has several manufacturing methods that eliminate or greatly reduce tooling expenditures. Our proprietary stamping process produces thin metal parks from .001" to .010" thickness with simple or complex shapes that are burr-free. Stamping without a tool is a great shim production process for aluminum, brass, steel or stainless steel parts. S.W.A.T can produce parts from 1" to 21" diameter. It is ideal for dimensional repeatability and low volume production, running well for the 10 to 3000 part range. We utilize two lasers for providing a great alternative to tooling for unique configuration parts, short runs and prototypes. CNC laser cutting allows for thicker parts from .010" to .250" to be produced with CNC controls that ensure precise accuracy throughout the process. 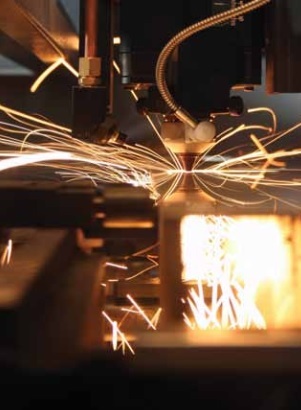 Our laser cutting is good for any quantity of parts and is suitable for aluminium, brass, steel and stainless steel materials. This process is also able to accommodate parts up to 47" x 95." Our CNC machining centers produce precision solid or laminated parts with superior edge quality. There is no separation of laminations from stamping shock and the layers are easy to peel when this process is used on laminated shims. Here at SPIROL we have accumulated thousands of common free-float and combo tooling which are capable of producing one and two hit special-dimension washers and OD/ID parts. Operational setup utilizes standard tools to produce a two-hit washer or OD/ID part. 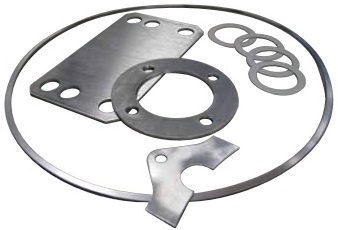 OD/ID combo tooling produces a wide variety of special dimension washers with one-hit. When statistical capability is desired, the OD/ID combo tooling method should be utilized. One-hit compound tooling will be used to guarantee product quality and repeated uses over the life of the tool for products with a long life cycle. Our die shop offers quality tool production at competitive prices due to our use of the latest CNC and EDM production technology. Compound tooling is ideal for long run parts with complex configurations. How does one know whether Tool-Less Technology or tooling is the best approach? Tool-Less Technology is the most economical and cost effective solutions with prototypes and short run shims. Whilst tooling should be the preferred method for where quantities and project life expectancy rise. Whichever results in the lower total cost will usually be the best choice. SPIROL's cost estimating staff will analyze potential production methods to determine which is the best based on the life expectancy of parts and volume requirements.